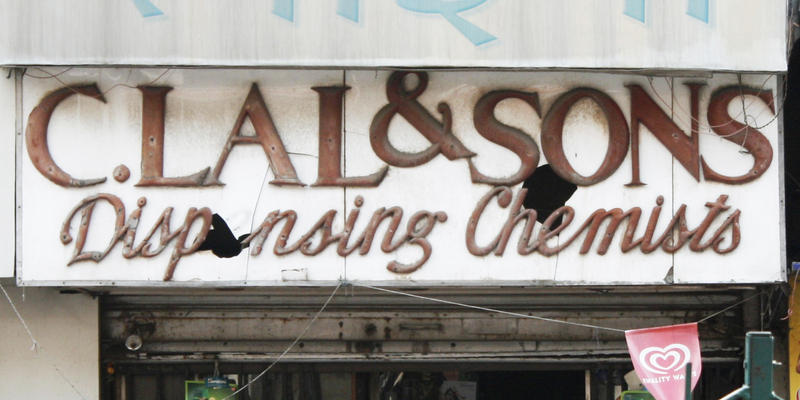 According to the Delhiwalla, Kashmere Gate’s C. Lal & Sons Dispensing Chemists has been in business since 1935, and was, in fact, the very first chemist shop in Delhi to be open twenty-four hours a day. I first spotted its wooden sign in July this year. And when I went back to the neighbourhood a few weeks ago, it was already gone. The spiky serifs and awkward script have been replaced by a printed sign. The shop was shut so I couldn’t ask the shopkeeper about it, but a bit of snooping around tells me that the original is still behind the new one. My big regret: I don’t have a better image of old wooden sign.